Hayley Gillespie’s devotion to Texas ecology runs deep. She wrote her graduate school thesis on the Barton Springs salamander, an amphibian that only lives in a natural spring in Austin, Texas. Now, like the Barton Springs salamander, she struggles to preserve her unique habitat — the Art.Science.Gallery. 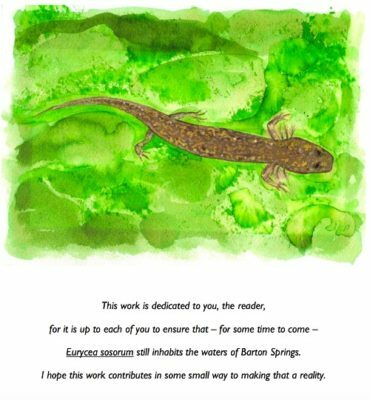 Gillespie painted this salamander in her thesis and dedicated it to the people who work to preserve the Barton Springs salamander. 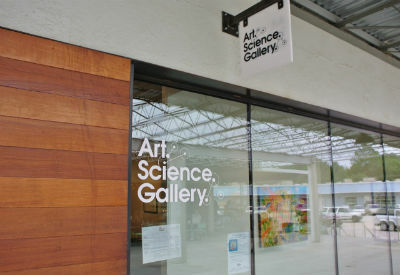 After getting her Ph.D., in ecology, evolution and behavior from the University of Texas at Austin, Gillespie founded the Art.Science.Gallery., a haven for different artists to display work on the environment, space and other visually interesting, science-related topics. Though there is no other museum in Austin, the gallery has cousins like the International Museum of Art & Science in McAllen, Texas, the Museum of Arts and Science in Macon, Georgia and the Louisiana Art & Science Museum in Baton Rouge, Louisiana. The Art.Science.Gallery. started as a pop-up gallery about five years ago and moved to its current location in Austin’s Canopy shopping mall in 2013. The Barton Springs salamander still exists because of the support of Austin’s advocates for science and the environment, who fought for gentler treatment of the spring and the salamanders (no power hoses, more plants). The Art.Science.Gallery. also benefits from the support of this community, who can connect with social media. “Austin is a really difficult town to sell art in,” she says. Fortunately, Gillespie reaches an international audience through the gallery’s website, Twitter, Facebook and Instagram. “We did a crowdfunding campaign to get a real space,” she says. She has done two other fundraising campaigns since in order to keep the gallery open — the 2016 fundraiser brought in $20,000. This allows her to keep work from over 50 artists in the Art.Science.Gallery. gift shop and share their work with other artists and aspirational observers who can’t physically get to Texas to experience the exhibits. “We put out calls for art and they go international with the help of social media — we reach pretty far,” says Gillespie. She hangs the artwork neatly in the large, white room. Museum-goers can walk around and examine each of the dozen or so paintings, or sit in the blue couches in the middle of the gallery to take in a view of many pieces at the same time. The art comes in every possible medium: In the exhibit I went to, there was a painting of bees with an audio component. In addition to the exhibits, Gillespie and her business and life partner, Jedidiah Dore, teach art classes. For adults. “A bunch of people ask what we do for kids, summer camps — do you come to schools?” she says. “There are so few ways for people to learn about science as adults, so that’s primarily our focus.” Gillespie is teaching natural history this summer. Dore’s class is on botanical field illustration and block printing. Despite the regular slog of fundraising and managing the logistics of international artists, Gillespie says that she isn’t quitting any time soon. “I get to see all of this wonderful work and I get to help promote the work that these people do and I get to educate people about science at the same time,” she says. The exhibit Far Out at the Art.Science.Gallery. just ended on July 29. It focused on astronomy, and the project was a collaboration with the American Astronomical Society and Women in Astronomy. The previous exhibit, Life as We Knew It, focused on the disappearance of the natural world. The Barton Springs Salamander was not featured. It lives to swim another day.